Guardians of the Twilight Stratospheres, Lancers accumulate lunar power as they fight, eventually erupting into full Lunatic Mode. They can also call down a blessing from their missing deity, and use Grappling Spear for damage and mobility. Chance to gain moon power on hit. 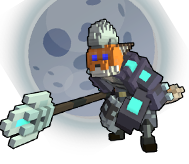 Gather enough to become infused with the power of the moon. When transformed you will have increased movement speed, 25% reduced damage and a 50% bonus damage. Summon a spear from the heavens that increases stability, heals, and adds to the movement speed of all allies. It also damages enemies caught in the area. Summon a spear from the heavens that boosts friends and harms foes. Throw a spear then use again to grapple to it. Each use deals light area damage. Throw a spear then use again to teleport to it. Each use deals light area damage. Wide-angled melee attack, second hit causes knock back and stun. Swing your spear in a wide-arc and charge for a second hit. The second hit deals heavy damage and knocks your targets towards the moon.